This is the second large print version of A Thief of Time published by G.K. Hall &Co.of Boston, Massachusetts in 1990. Other than being a paperback, this edition is physically the same as the first large print edition printed in 1898 by G.K. Hall &Co. 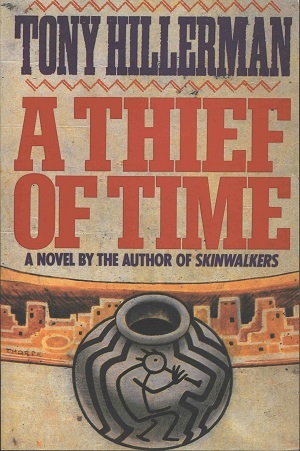 The cover design is by Peter Thorpe and depicts a black-on-white ceramic vessel with Ancient Puebloan ruins in the background. This cover is featured on a number of editions of this book, including the first large-print edition. Binding: Full-color pasteboard cover with LARGE-PRINT, author, title, and publisher's logo printed vertically on the spine.